On 21 October 2015, the State of Europe’s Forest report 2015 has been presented and launched at the 7th FOREST EUROPE Ministerial Conference in Madrid. The Report has been elaborated collecting information provided by over 300 national correspondents and national and international experts; this edition has been coordinated and compiled by FOREST EUROPE’s Liaison Unit Madrid in collaboration with the Food and Agriculture Organization of the United Nations (FAO), the European Forest Institute (EFI), the European Commission Joint Research Centre (JRC) and the University of Hamburg (UHH). The UNECE/FAO Forestry and Timber Section supported the process in collecting, processing and reviewing parts of the information. According to this document, Europe’s forest area has expanded to 215 million ha and the average growing stock with 163 m2/ha is above the world average (133 m2/ha) and is still increasing. Between 2005 and 2015 the average annual sequestration of carbon in forest biomass, soil and forest products reached about 720 million tonnes. This corresponds to about 9% of the net greenhouse gas emissions for the European region. 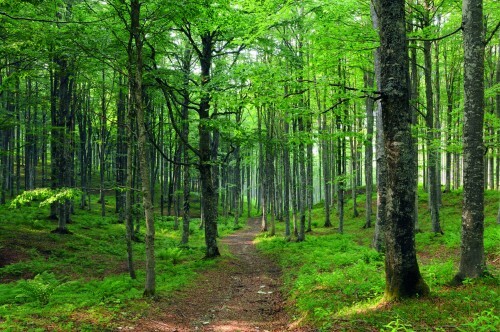 As reported, the increasing awareness of the importance of forests to mitigate and adapt to climate change is highly reflected in various forest policies at national and European level. The socio-economic functions of forests play increasingly an important role in the region’s economy. The contribution to Europe’s gross domestic product (GDP) for instance amounts to EUR 103 billion annually, which corresponds to 0.8 % of the total GDP and the forest sector in Europe provides jobs and income for at least 3 million people. Privately owned forest area has slowly increased up to 51% within the UNECE region, and that the number of private forest holdings has increased by approximately 18% since 1990. This transition from former public state managed forests to more private forests with millions of new forest owners has led to new structural and management challenges but also provided great new opportunities to privatise and strengthen the forest sector and economy in many European regions. Despite the fact that the European forest sector was affected by the recent global economic recession, it seems now on a steady path of recovery. Europe still remains one of the world’s biggest producers of equivalent roundwood and has moved from being a net importer of primary wood and paper products to a net exporter. In particular as reported in the document, information on total roundwood production was provided by 38 countries, representing 60% of the forests in the Forest Europe area. For 2010, a total of 407 million m3 of roundwood removals was reported, 140 million m3 of which were located in Central-West Europe and 144 million m3 in North Europe (see Table 33). The highest total removals of roundwood at country level occurred in Sweden (70 million m3), France (54 million m3), Germany (53 million m3) and Finland (48 million m3). Removals per hectare of Forest Available for Wood Supply (FAWS) ranged from 4.4 m3/ha in Central-East Europe to 1.1 m3/ha in South-West Europe. Sustainable forest management in Europe is directly contingent on sustainable markets for forest products and vice versa. The consumption of roundwood and all of its products and by-products is a factor in the sustainable development of the forest sector. Profitability in most forests is dependent upon sales of roundwood, and, to a growing extent, sales of forest residues for energy. The revenue from sales of wood supports most activities and treatments in forests. The price of saw logs is particularly important for the profitability of forest operations, thus the demand for solid wood products plays a crucial role for the mobilisation of pulpwood and forest residues. In this context it is worth noting that the recognition of the environmental benefits of the use of wood in construction is slowly increasing throughout Europe. This could result in far greater consumption in the future. Wood consumption in Europe remains well below forest growth. Thus, harvests fall short of annual growth by approximately 36%. There has been a trend for the substitution of tropical timber with timber from temperate and boreal forests with oak being widely used as a substitute for tropical hardwood timber. Moreover, within the EU, there has been a shift from imports of tropical timber to further processed products. A substantial part of these further processed tropical timber products come from Asia. Indeed, imports of primary and secondary processed wood products have increased enormously, i.e. by over 30% in value since 2005. Most of these increased imports come from China, whose exports to Europe have grown by over 60% since 2005.